The illegal occupation is a military occupation: since 2000, Israel has killed more than 9,000 Palestinians. This includes almost 2,000 children, that is one child killed every 3 days. Palestinian organisations have called for "boycott, divestment and sanctions" (BDS) to put non-violent pressure on Israel (in the same way that boycotts played a crucial part in ending apartheid in South Africa). Churches, universities, businesses, banks and pension funds have already imposed penalties on Israel. The BDS movement has had many notable successes over the last few years, but since Israel's massacres in Gaza in 2014, people have been refusing to buy Israeli goods in a big way. On 11 August 2014, the Israeli paper 'the Marker' reported that "importers from Europe are telling us they can not sell Israeli products." In 2013, the $210 billion Dutch pension fund PGGM announced its divestment from Israel's 5 biggest banks. The $820 billion world's largest wealth fund in Norway divested from 2 Israeli companies involved in illegal settlement building. Over the last year, large banks and businesses in Denmark, Holland, Luxembourg and Argentina have terminated substantial contracts with Israeli firms. A priority of the bds movement has always been Israeli fruit and veg. The Israeli wholesaler Agrexco was forced into liquidation in 2011 after it was targeted with blockades, demonstrations and direct action throughout Europe. The boycott of Israeli fruit and veg still plays a major part of the bds movement as shown by the Sainsburys Taste the Indifference campaign. Musicians such as Annie Lennox, Sinéad O'Connor, Roger Waters, Massive Attack and Gil Scott-Heron have refused to play in Israel. The academic boycott was boosted by Professor Stephen Hawking refusing to attend a conference in Israel. Churches have played a prominent role in the movement to divest from Israel. The Methodist church in Britain has recommended that its members boycott goods from illegal Israeli settlements. Likewise, Quakers in Britain agreed to boycott products from the illegal settlements. The Church of England Synod has also voted for disinvestment. 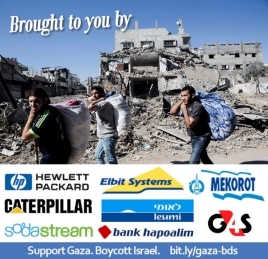 In 2012, the Presbyterian Church in the US decided to boycott all Israeli products manufactured by Israeli companies operating in the occupied Palestinian territories; in 2014 it voted to divest from Caterpillar, Hewlett-Packard and Motorola. The Geneva-based World Council of Churches has called for divestment. In 2014 the pension board of the United Methodist Church in the US agreed to divest its shares in British occupation profiteer G4S. Hewlett Packard provides the Israeli ocupation forces with a range of IT products which includes the operation of an ID system installed in Israeli military checkpoints in the occupied West Bank and Gaza. HP provides the Israeli navy with IT infrastructure. The Israeli navy is used to enforce the illegal blockade of Gaza from the sea, to prevent Palestinian fishermen from carrying out their trade, and to bombard Gaza during major assaults. HP is therefore clearly complicit in Israel's policy of collective punishment. As part of the City Pass consortium, Veolia helped build the Jerusalem Light Railway. The railway has been built on stolen Palestinian land and links Jerusalem to the illegal settlements in the West Bank. Veolia originally planned to operate the railway, but pulled out due to pressure from the bds movement. In the occupied Jordan Valley Veolia has been supporting illegal settlements by taking their refuse at its Tovlan landfill site. Pressure has been put on councils, transport authorities and universities to terminate contracts with Veolia. Veolia has lost an estimated £16 billion in contracts. The company has now pulled out of the Israeli market. Elbit provides both drones and other military technology for Occupation forces as well as security systems for the Apartheid Wall and settlements. Elbit's weapons are routinely used on the people of Gaza. Elbit's drones are sold on the global market as "battle tested" devices, increasing their appeal and leading to their adoption by a number of international militaries. August 2014. The Elbit factory near Birmingham was occupied and closed down (above) for 2 days. This was while Israel was carrying out massacres throughout Gaza - using Elbit drones. The occupiers made it clear that "we took took direct action because grassroots movements must act when governments allow and enable such atrocities." More information here. 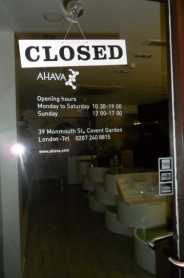 Ahava, occupation profiteer's only UK store in London was closed down after regular demonstrations and pickets. Ahava uses Palestinian natural resources plundered by the company near Kalia, a West Bank settlement and has its manufacturing plant and visitors centre based in another settlement, Mitzpe Shalem. 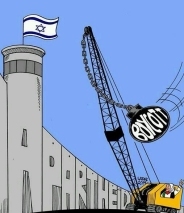 In 2005, 173 Palestinian organisations called for people throughout the world "to impose broad boycotts and implement divestment initiatives against Israel similar to those applied to South Africa in the apartheid era." In response to Israel's massacres in Gaza in 2014, Palestine activists and port workers stopped 2 Israeli cargo ships from discharging cargo. In August, pickets stopped the freighter Piraeus from docking over a 3 day period - at one point it was able to dock briefly, but was only able to discharge a small amount of cargo. In the end, the vessel had to make its way to Los Angeles with most of its cargo still on board. In September, the ZIM freighter Shanghai wasn't able to discharge any containers - dockworkers at Oakland refused to unload cargo by not crossing picket lines. The freighter set sail with all its cargo still on board. The power of joint action by workers and Palestinian solidarity activists is one of the most positive forms of action that can be taken in support of the Palestinian people. 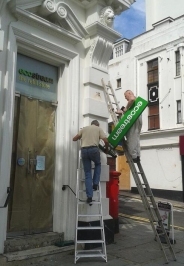 The 'flagship' UK store in Brighton of occupation profiteer Sodastream closed down after regular pickets and demonstrations outside the shop for almost 2 years.